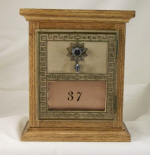 Offering the finest in Post Office Box Banks ! 2-18-12- I've been working on the site some more- I've added a shopping cart button for doorless banks to everything but the Coopered Round Banks (those are just too fussy to get fitted right). I've got a good supply of pretty much everything at the moment, although some items are still unfinished- you might need to allow for a few days for me to get the finish applied. Look for me on Facebook under "Postalbanks"! Thanks for your interest in my banks! I have a supply of decals matching the original Post Office number decals, and if you request it, I will put the number of your choice on a bank, or banks ($5.00 charge per bank). If ordering more than one bank, please be specific about which bank/s get the custom numbers. There is an order button for this along with each bank. 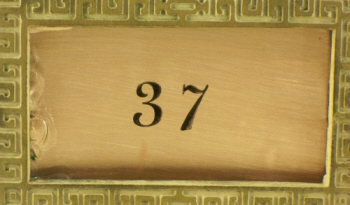 I'll be happy to prepare a number plate for you in brushed copper or aluminum- the numbers are done in special ink right on the metal. With this process, I can also do names, up to five letters for small doors, and seven for large doors. Price is $5.00 per. This is in the same order button as the custom decals above. 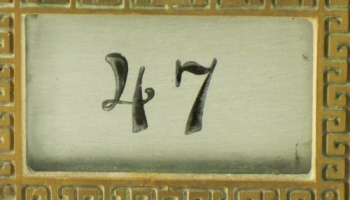 In the examples below, the numbers are actually the same size- the aluminum is on a small door, and the copper on a large door. I've just cropped the pictures to be the same size. 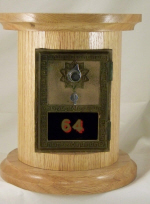 If you've looked around at the Post Office Box Banks being offered by others, you might have noticed that many of them come with a brass slot cover. I've never been inclined to use them(I prefer just to make an attractive bank),but they did give me an idea. Here's the result of that idea- price is $5.00, and they can be added to any bank. I've added an order button for this to most of the banks. Just let me know a general color preference. 2-5-12-Well, if you've visited the site before, you can see that I've been making some changes- I've generally cleaned everything up, and gotten rid of, or moved some things here and there to make it easier to use. I've also reinstituted the Paypal shopping cart- this time with buttons for the extras included with each bank. I've also added "Black" as an option in stains (there's always someone that wants a black bank! :). If you need to make a large order, let me know, and I'll put everything together in a package for you, and simply let you know an amount to send through PayPal. 2-4-12- Been working hard out in the shop! I've finished a bunch of banks, with a bunch more out in the shop in the process. I've decided not to sell unfinished banks- reason being that it's almost impossible to achieve a good finish on one of my banks after it's fully assembled- so, instead, I'll be offering fully finished, but doorless banks. Pricing will be $10.00 less for a bank with a #1 door, $15.00 less for banks with #2 doors. Also, I have reactivated my etsy shop- CrosstimbersCrafts, so that I can have banks ready for everyone to choose from, as well as sell some of the other items that I enjoy making. 11-25-11- I'm currently working on upgrading the site- something I haven't worked on in some time. I like for this purpose. (for those who have their own doors) to the line. © 2003 Postalbanks.com - All rights reserved.